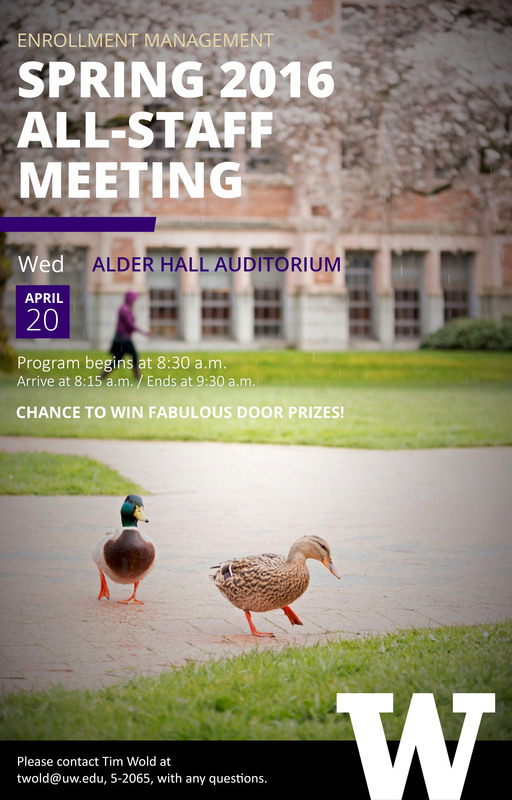 The Spring all-staff meeting is tomorrow morning at the Alder Hall Auditorium. The program begins at 8:30 a.m. and ends at 9:30 a.m. The all-staff meeting will provide all Enrollment Managment colleagues with the opportunity to listen to EM updates and announcements, and you’ll learn about the exciting projects that are taking place in your fellow EM units. Make sure to mark your calendars, and please be sure to arrive fifteen minutes early! You may even be one of the lucky winners to take home an awesome door prize!